The School of Jewellery, Birmingham City University, was opened on the 18th September 1890 and is celebrating its 125th anniversary in 2015. Staff at the School are currently in the early stages of planning a series of events which will span the full calendar year, and celebrate the past, present and future of the School. “One of our 2015 activities centres on our alumni. We want to try to identify as many people who trained at the School of Jewellery as possible, to identify items of their work which are on public display, and to find out what they are doing now! We will shortly be circulating a questionnaire for alumni to complete about their time at the School. If you studied at the School as an apprentice, a part time or full time student we would like to hear from you! 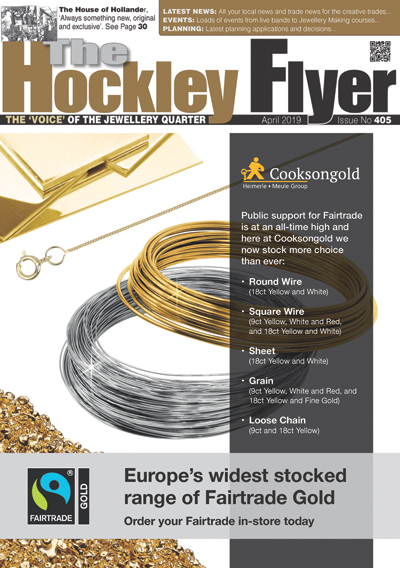 Further news and updates on events for 2015 will be featured in future Hockley flyer issues.